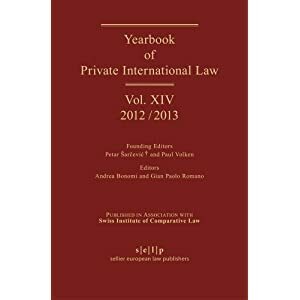 The latest volume of the Yearbook of Private International Law was just released. Marc Fallon & Thalia Kruger, The Spatial Scope of the EU’s Rules on Jurisdiction and Enforcement of Judgments: From Bilateral Modus to Unilateral Universality? A General Part for European Private International Law? Luís de Lima Pinheiro, The Methodology and the General Part of the Portuguese Private International Law Codification: A Possible Source of Inspiration for the European Legislator? Guangjian Tu, The Codification of Conflict of Laws in China: What Has/Hasn’t Yet Been Done for Cross-Border Torts? Rui Pereira Dias, Suing Corporations in a Global World: A Role for Transnational Jurisdictional Cooperation?